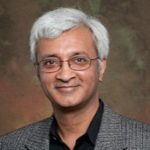 Rangarajan Sundaram is Yamaichi Faculty Fellow and Professor of Finance at New York University’s Stern School of Business where he teaches derivatives pricing and risk-management. He was formerly at the University of Rochester from 1988-96. He received his BA in Economics from the University of Madras, India, in 1982; his MBA from the Indian Institute of Management, Ahmedabad, in 1984; and his PhD in Economics from Cornell University in 1988. Professor Sundaram’s research in finance covers a range of areas including agency problems, executive compensation, corporate finance, derivatives pricing, and credit risk & credit derivatives. He has also published extensively in mathematical economics, decision theory, and game theory. His research has appeared in leading academic journals in finance and economic theory including Econometrica, Journal of Economic Theory, Journal of Business, Journal of Financial Economics, Journal of Finance, and Review of Financial Studies, as also in several practitioner-oriented journals. He received the Jensen Award in 2001 from the Journal of Financial Economics and was a finalist for the Brattle Prize from the Journal of Finance in 2005.